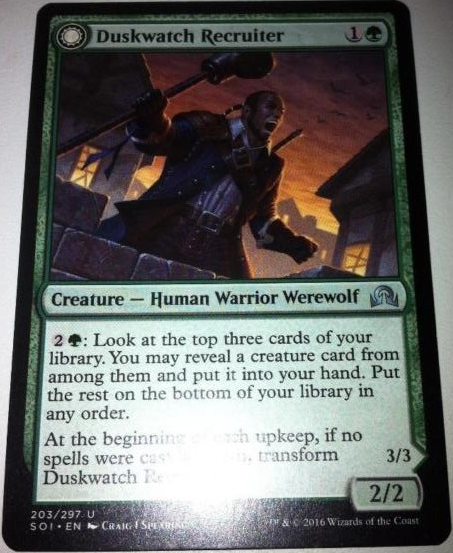 Hello.SOI will show us new double-faced cards.Today we see Duskwatch Recruiter//Krallenhorde Howler. It can add a creature card from your library by paying 2 for body and 3 for activating.Isn't its cost so cheap compared to Azure Mage?A new star for 5C-Human decks probably? 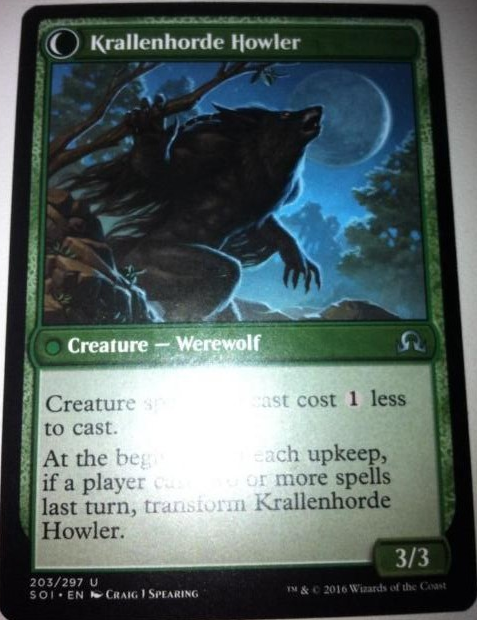 Unflipped, it is a "late game" bear, since does not attack neither hate the opponent, but allows some refill. Once flipped, it makes spells cheap, but in theory we are already in the late game and have enough mana to deploy a depleted hand, so it seems *bad*. Both sides die to most removal including bolt, and seems a slow card to gain CA. Mayor was good because it helped against MUD/Stax by generating tokens. This guy is way worse, and his ability is expensive for what is does. Non creature spells cost to cast. When FB damages an opponent, look at his/her hand and discard a non creature spell. when redhatebear comes into play, you can sacrifice a permanent. If you do, gain control of target artifact.